A larger version of our standard intruder, but tied on a tube, the Chinook Intruder is approximately 4” in length. Using a generous amount of flash and UV enhanced ostrich and schlappen, this intruder is sure to anger a chinook into striking the fly. Rigged with a stout ring eye black nickel hook. 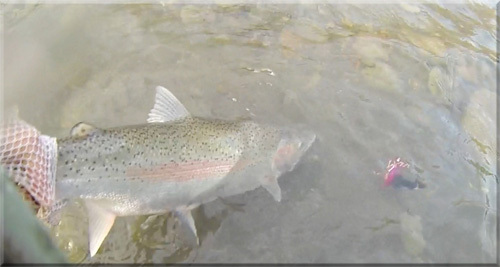 Also an excellent large Intruder Steelhead fly. A larger version of our standard intruder, but tied on a tube, the Chinook Intruder is approximately 4" in length. Using a generous amount of flash and UV enhanced ostrich and schlappen, this intruder is sure to anger a chinook into striking the fly. Rigged with a stout ring eye black nickel hook. Red/Orange - Good color for bright sun and muddy off color conditions. New for 2017, a moal leech on steroids +. A String Leech with 65 lb braid line supporting a 1/0 hook strong enough for huge King Salmon. The Black rabbit is the core of the fly giving it silhouette and movement - nothing moves like rabbit. Two colors of Rhea are tied in with corresponding flashabou. 2/3 up the fly is a 1/4 inch bead with Intruder hackle wrap toward the head, then Rhea, and Guinea hackle. This gives the fly more silhouette that can't collapse and allows the fly to swim better in softer water. Finished off with a thread head. This fly has been a Chinook Salmon Killer Fly in colored water. I tried many different patterns and combinations, but as soon as I tied this fly up, and used the first morning in off color river conditions. I had landed three 20 lb Chinook Salmon. 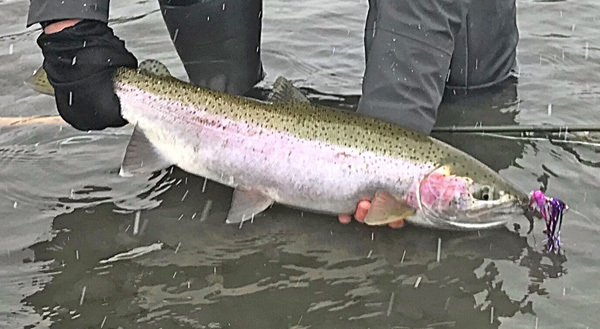 To make sure it was not just a special day, I went the next morning I hooked and lost a huge steelhead when tailing and landed a 16 lb King Salmon. Fly is tied using black cross cut rabbit strip tied on braid line like a Moal Leech, then lots of Red Rhea spun on, followed by Red Flashabou, and Red Guinea and red bead cone. The Black Rabbit core gives this fly lots of silhouette and animates the flashabou. Two different colors with corresponding Flashabou. A good King Salmon Fly. Moal leech with lots of flashabou. Chinook, King Salmon unlike Steelhead often like mono, single color flies. If the aren't hitting one color switch to another, rather then swing a multicolored fly by them. These flies are custom tied. Hook Sizes: Size 2 (fishes better), Size 1 (stronger) Owner Hooks SSW Super Needle Point Hooks. Hook Sizes: Size 2 (Chartreuse only in this size) (fishes better), Size 1 (stronger) Owner Hooks SSW Super Needle Point Hooks. This pattern came from Grabflies "King Intruder Leech, Red". I have caught a lot of Steelhead on this pattern. 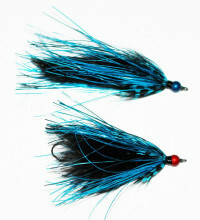 Also see Custom Blue Flash Moal Leech, and Coho Salmon. Fly is tied using black cross cut rabbit strip tied on braid line like a Moal Leech, then lots of Blue Rhea spun on, followed by Blue Flashabou, and Blue Guinea and red bead cone. The Black Rabbit core gives this fly lots of silhouette and animates the flashabou. Fly is tied using black cross cut rabbit strip tied on Fireline braid like a Moal Leech, then lots of Chartreuse Rhea spun on, followed by Chartreuse Holographic Flashabou, and Chartreuse Guinea and a Chartreuse bead cone. 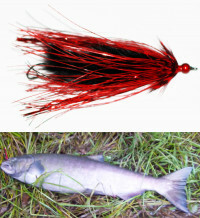 This pattern came from Grabflies "King Intruder Leech, Red" but I have only fished it for Winter Steelhead. In off color rivers like the Hoh river on the Olympic Peninsula. My first try with this fly I caught two Steelhead and no other flies were producing any results. 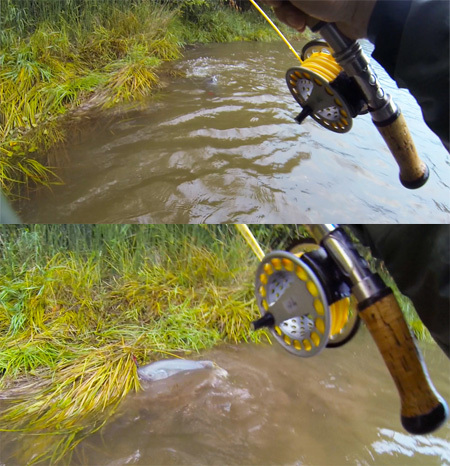 I used a four inch King Intruder Leech, Pink on the Hoh, but clearer water rivers I use the three inch size. 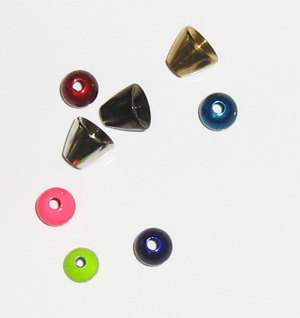 Two Size: 3 inch and 4 inch. Two hooks size: Size 2 (recommended works better) Size 1/0 for huge Salmon that may bend your hook - only on four inch flies. This hybrid Mega Moal Leech has become the new "go to" winter fly. 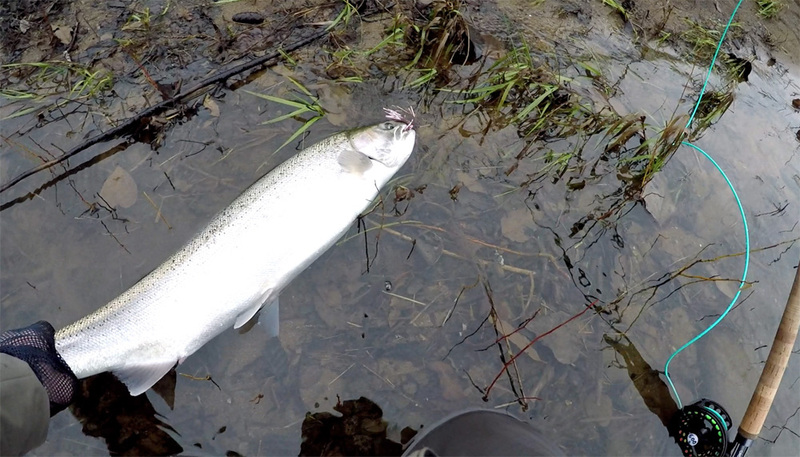 Just like the Mega Moal this fly moves tough winter Steelhead. 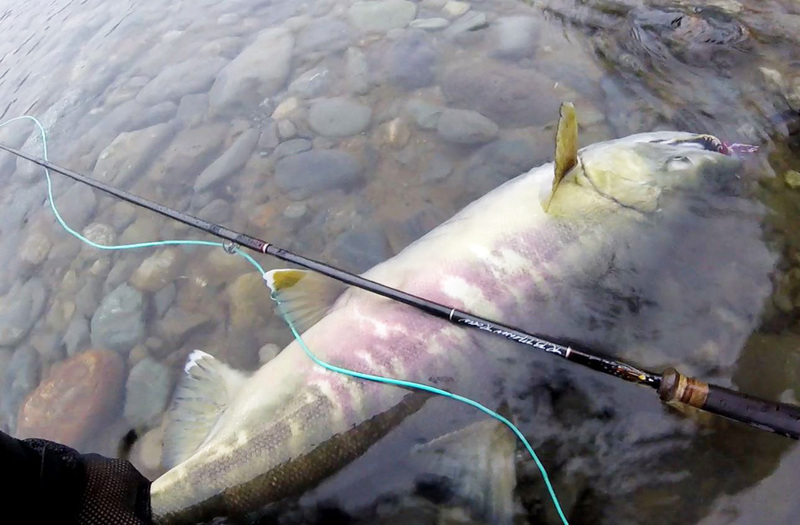 The BigMoal MT which is custom tied by Grabflies.com has caught Steelhead for Grabflies this winter after already fishing the run with a Mega Moal. The different accents and tail action seem to make that subtle difference. 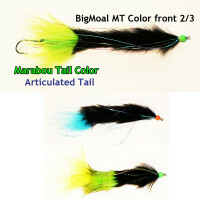 TheBigMoal MT measures 6 - 6.5 inches long, but only 5 inches of rabbit fur, 1.5 inches of Marabou. 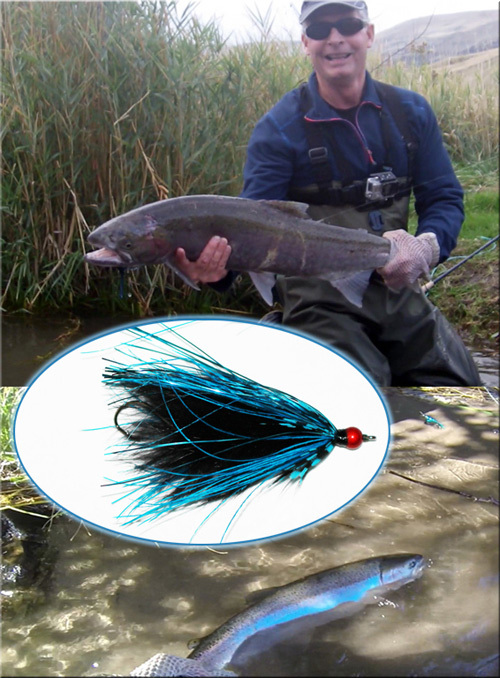 Trailing hook with the added Marabou tied directly on hook gets fouled less when making long Spey casts. 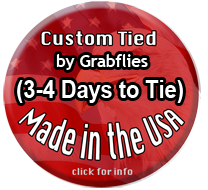 Fly is custom ordered and you can custom designed your fly to get that perfect color combination for your river. Moal leeches are tied entirely on a string with a trailer hook at the back. This gives the fly greater action than a fly tied on a rigid hook. More fish are landed with the Moal fly as well because of the smaller offset trailer hook. This Neo Skagit Leech is a smaller version of the original Skagit Leech. It is tied with a hidden .25" nickle bead. The hidden bead helps prop up the Marabou which has stiff Guinea and Prop Hackle in front of it. 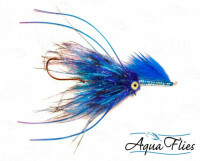 The fly swims different, and snags less as the bead will not snag on rocks. 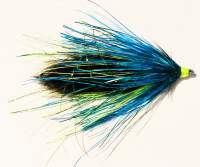 This is a marabou intruder style fly intended for Kings, but it is also a great pattern for Coho and steelhead. Very well known fly in BC.